As you gear up for the gardening season, be thinking about ways to be more sustainable this growing season. One such way is by watering your garden and lawn with FREE water. By using water that falls from the sky, not only are you being less wasteful and more environmentally friendly, you’re also saving yourself money on your water bill! So how do you collect it? With a rain barrel. A rain barrel is a container that captures rainwater. They usually range in size from 50 – 80 gallons and have a spigot for filling up water cans as well as a connection for a soaker hose. You can place your rain barrel under a downspout to reduce the amount of rain that hits the ground and threatens the foundation of your home. This can also help to reduce erosion, mold growth, and flooding! When it rains, runoff can pick up fertilizers, pesticides, soil and many other contaminants. These flow into our lakes, ponds, and wetlands which can promote algae growth and alter healthy habitats. By collecting water, you are assisting in reducing this runoff from transporting pollutants. Your flowers and vegetable gardens will stay healthy and strong if you water them with rainwater. It is highly oxygenated and is free of salts and fluoride compounds that can be potentially harmful to your plants root system. Because rainwater is free of salts and fluoride compounds, you can use it to wash your car, bathe your pet, or rinse your driveway safely and worry free! At ICNC (as well as some other home improvement stores)! 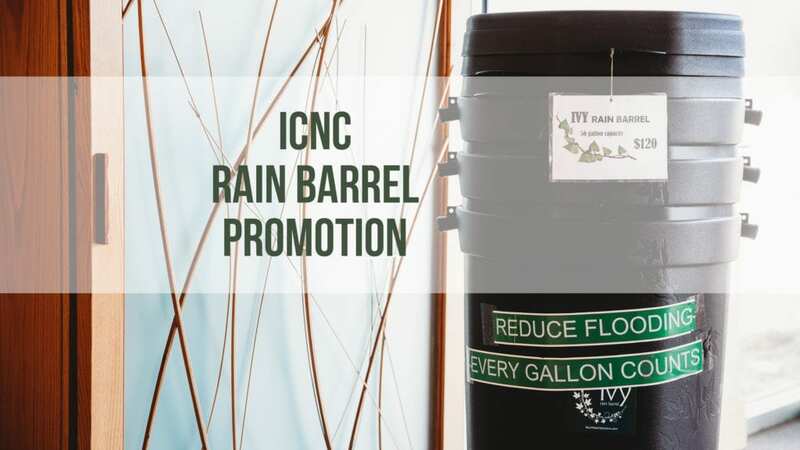 We sell rain barrels year round at our Creekside Shop, but as a special Earth Day promotion April 20 – April 30, ICNC members* will receive a 20% discount on rain barrels; nonmembers will receive 10%. *Members who are at the Explorer and above level always receive 40% off a rain barrel purchase. So you’ve purchased a rain barrel…Now what? You will want a sturdy, level platform that can hold up to 400 pounds (peak weight when filled with water). This will make your spigot more accessible. You will also want an extra hose to direct overflow to an appropriate area that can handle it, like a flower bed, rain garden or a patch on your lawn that needs it. Throughout the season, clean the barrel’s screen filter to allow full water collection capacity. Make sure that your hose has a tight connection periodically. Before the next cold season, you will want to winterize your rain barrel by disconnecting the hose and emptying the barrel. This will prevent the water from freezing and cracking your barrel. Keep in mind that collected rain water is not suitable for human consumption but is safe for your plants.